Thanks to all who attended our annual Sweetheart Tea Luncheon for our Silver Sneakers members! If you have Silver Sneakers as part of your Medicare or Health Insurance Plan, take advantage of the FREE membership available to you at HHF! We will be adding two additional Silver Sneakers classes beginning in March! Everyone gets the same special treatment here at HHF! 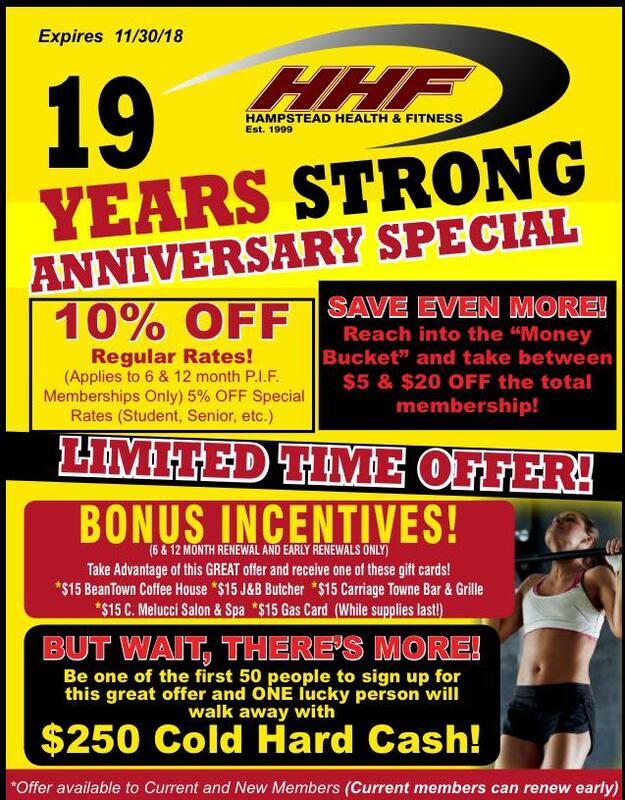 Fair is fair, just good ol’ $$ off our paid-in-full memberships or ask for 1/2 off joining fees for our EFT memberships for EVERYONE to get you off on the right foot. Current members; not expired yet? Purchase your renewal early and save $$! Need a trainer to help get you started? 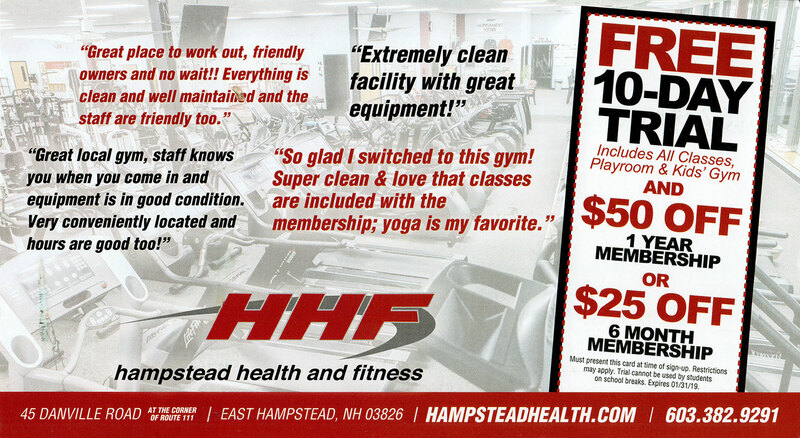 One complimentary session with your new membership! 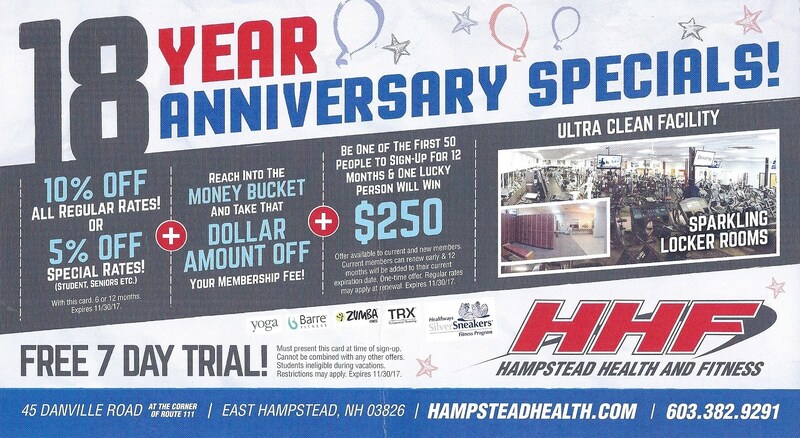 https://i1.wp.com/www.hampsteadhealth.com/wp-content/uploads/2018/09/anniversary19-feature.jpg?fit=300%2C300 300 300 Admin http://www.hampsteadhealth.com/wp-content/uploads/2016/05/Hampstead-Health-Fitness.png Admin2018-08-31 21:15:412018-09-13 21:18:27Anniversary Special! Fred Archambault: Fitness ‘IS’ the fountain of youth! So privileged to have this great man as my friend and his visits to my office 3 times a week. It’s 10 minutes of your time to undoubtedly be positively impacted by this individual. He is truly, I state “1 in a million” on the video but in reality, I would bet the only person with this ability on planet earth! I don’t know many people in fitness that can do 20 pull-ups and bench 200 pounds, Fred does it at 94 years young and weighing 155!! A little miscommunication at 7:45 of the video but watch through that, it’s worth it to get to the ending! Fitness ‘IS’ the fountain of youth! If you’re not taking care of yourself, START TODAY! https://i0.wp.com/www.hampsteadhealth.com/wp-content/uploads/2017/07/Fred-Archambault.jpg?fit=300%2C300 300 300 Admin http://www.hampsteadhealth.com/wp-content/uploads/2016/05/Hampstead-Health-Fitness.png Admin2017-10-05 20:35:082017-10-08 20:37:43Fred Archambault: Fitness 'IS' the fountain of youth! 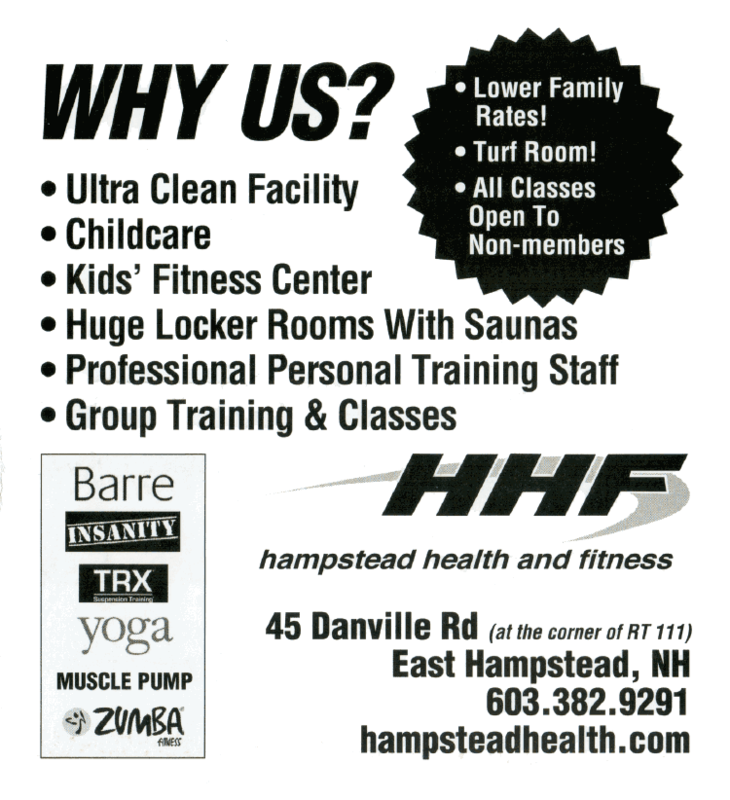 At HHF we strive to provide you with the most versatile, result-producing, and fun Group Exercise Program that exceeds your expectations. We will only achieve this with your honest input. Please take a few minutes to provide us with information to help us design our 2017 Fall & Winter programs. Thank you for your time. HHF opened its doors for the first time 18 YEARS ago this month! How time flies! To celebrate our anniversary we’re running a promotion to spread the love — All who join during our anniversary special get applicable discount, bonus cash and are placed into the drawing for $250 cash! Current members can renew early and receive a bonus gift card to a great local business! Click on the image below to view the details. https://i1.wp.com/www.hampsteadhealth.com/wp-content/uploads/2017/09/18balloons.jpg?fit=295%2C295 295 295 Admin http://www.hampsteadhealth.com/wp-content/uploads/2016/05/Hampstead-Health-Fitness.png Admin2017-09-12 14:04:442017-10-08 20:34:0318 Year Anniversary Specials!